If only there were a perfect analgesic (meaning painkiller) that would act on only the pain pathways in mother and didn’t cross over the placenta to baby. Unfortunately, complete pain relief without risk is a promise no doctor can deliver. When narcotic analgesics relieve mother’s body of pain, they also affect baby. An additional concern about narcotics is their effect on the mind, impairing the ability to focus. When combined with natural pain relievers, however, properly used medical pain relievers can get a laboring woman back on track by providing temporary relief, which allows her to rest and recharge. Here is what every mother-to-be should know about choosing and using narcotic pain medication during labor. Narcotic analgesics (such as Demerol, morphine, Nubain, Stadol and Fentanyl) reduce pain during childbirth by blocking the pain receptors in the brain. Analgesics affect different persons differently. Not only does the degree of pain relief narcotics provide vary from woman to woman, so do the mental and emotional side effects. Some mothers feel a lot of relief within 20 minutes of the shot, some report only slight relief. Others report little pain relief, claiming the foggy mind was worse than a hurting body. Some women enjoy the euphoria a narcotic pain medication during labor can cause; a floaty feeling that helps them take their mind off their labor. Other mothers find narcotics compromise their ability to make decisions that benefit their labor progress. If a mother’s mind is too muddled to participate in managing her labor with movement and changes of position, her labor may be prolonged, as will her pain. Narcotics can also make you feel very sleepy, so much so that you sleep between contractions and wake only as each one peaks, unable to focus and stay “on top” of the contractions. When mother gets an epidural during labor, baby gets the effects of the painkiller as well. Let’s follow a typical narcotic from the time it’s injected into mother to delivery and postpartum, to see how it can affect baby. Within 30 seconds after a narcotic is injected into mother intravenously, it enters baby’s circulatory system at around 70 percent of its concentration in mother’s blood. Since babies can’t talk and tell us how these drugs make them feel, we can only guess from studying external effects. Electronic fetal monitor tracings of babies whose mothers received narcotic pain medication during labor show heart rate patterns that differ from normal. Babies’ brain wave tracings (electroencephalograms – EEG) change, as do their respiratory movements. Depending on the type, dose, and timing of the pain medications, babies born under the influence of narcotics sometimes show respiratory depression and require temporary assistance to stimulate their breathing. They may also be a bit groggy as they first enter the world. Bonding may be affected; a drugged mother and a drugged baby don’t make a good first impression on each other. These newborns are also slower at learning how to breastfeed. Narcotics given during labor have been detected in babies’ bloodstreams up to eight weeks after birth. Select the right drug. With the assistance of your mate and your labor support person, discuss with your doctor or anesthesiologist which drug is best for your particular labor situation. Which one is likely to give you the quickest, most effective pain relief with minimal effects on your baby? In our experience, Nubain is the most effective in taking the edge off the pain and has the fewest number of side effects. Select the right time. 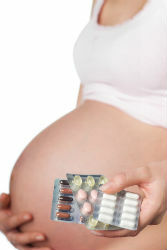 Analgesics given too early can slow the progress of labor. In the early stages of labor, narcotics are known to decrease the strength of contractions and slow dilatation of the cervix. If given too late, they can depress baby’s breathing. The best time to administer narcotic pain medication during labor is when your labor is very active (6-8 centimeters), just before you enter transition, or if your contractions become so overwhelming that you are losing control. Because the effect of narcotics on a newborn’s nervous and respiratory system peaks around two hours after they are given, doctors prefer not to give these drugs within two hours of when they expect you to deliver. They want to give the drug time to wear off, at least to the point that it does not compromise baby’s ability to breathe after birth. Thus, physicians do not feel it is safe to give narcotics to the mother once the pushing stage has begun. Fortunately, once you have the urge to push, your need for medical pain relief will be greatly diminished. Don’t worry, however, if a situation arises in which you must have a narcotic pain reliever during the pushing stage, baby can be given an injection of a narcotic blocker (Narcan) immediately after birth, which at least reverses the effect of the drug on baby’s ability to breathe. Select the right route. Getting the pain medication during labor intravenously gives you relief more quickly than an intramuscular injection. Intravenous pain medications also wears off faster. After an intravenous injection a mother usually feels some relief within 5-10 minutes; this relief may last around an hour. Intramuscular injections, on the other hand, typically take half an hour to an hour to reach full effect, but the relief may last 3-4 hours. In either case, some mothers notice that the second dose is not as effective as the first. Most women choose the intravenous route; if labor pain is overwhelming enough to require medical relief, you want it to happen fast, and you probably also need intravenous fluids. Request a Heparin-lock, which allows you to move from your bed and to adjust positions more easily, rather than being tethered to a bedside intravenous bottle.